Like the Community and the Children's House, the elementary program follows Maria Montessori's principles of freedom and responsibility, independence, individualized lessons, long work cycles, a love of learning. However, the elementary child is in a new developmental phase-- The Second Plane of Development-- and therefore needs an environment suited to his particular intellectual and social characteristics. Socially, the elementary-age child is distancing himself from his family and forming stronger bonds with his peers. 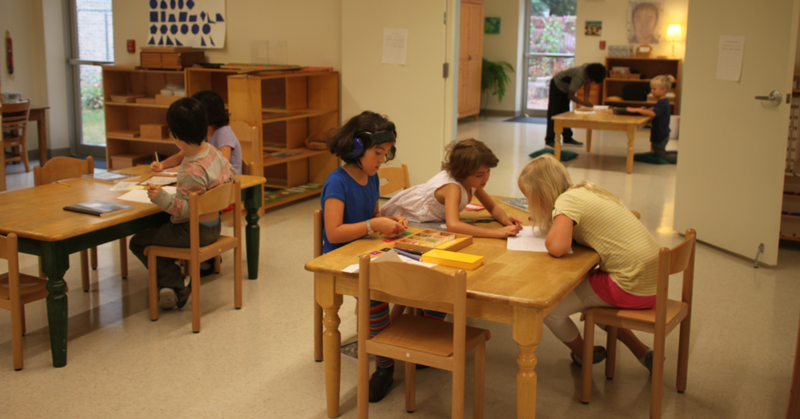 Rather than fight against this "group instinct" as conventional schools do, the Montessori elementary environment encourages children to learn in groups, to collaborate and assist one another throughout the day, and to solve interpersonal problems themselves. Large tables rather than desks fill the room, and a hum of conversation hovers in the air. Geography: The study of the universe and its physical contents serves to ignite the children's imaginations and to lay the foundation for a life-long interest in science. "Key lessons" in topics such as astronomy, geology, and matter are a springboard for the children's independent study and research. Biology: Zoology, botany, and the human body are explored indepth, with a focus on classification. History: The story of human beings on earth is a fascinating and endless field of study for elementary-age children. Presented primarily through story-telling, the study of history engages the children's imaginations, as well as their growing mastery of reading and writing. Language: In addition to reading and writing, the elementary language program studies grammar in great depth. Mathematics: The Montessori elementary math program can be seen as a journey from the concrete to the abstract. Hands-on manipulatives lay the foundation for a true and deep understanding of math concepts, and the transition to abstract algorithms occurs naturally. Geometry: Much more than a mere subset of math, geometry in the elementary program is studied in great depth, from nomenclature to algebraic formulas. The Montessori elementary program is often called "Cosmic Education" because Maria Montessori gave the entire universe to the six- to twelve-year-old child as his "curriculum." He learns that all things are connected, that knowledge is interdisciplinary, and that he himself has an awesome responsibility to the world and society.